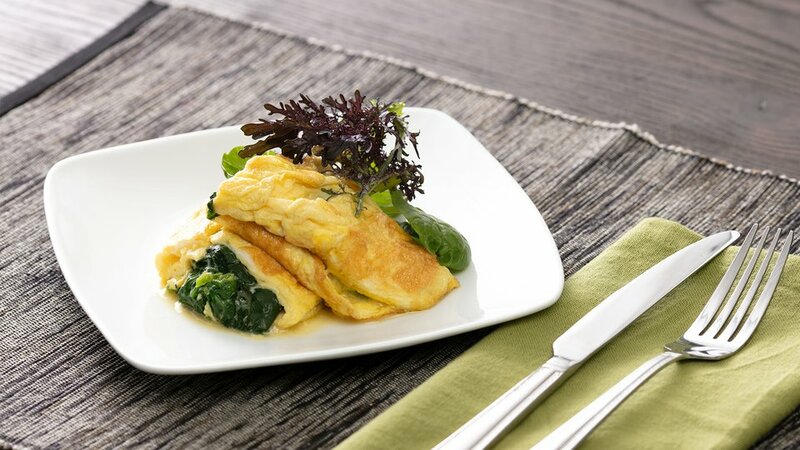 Spice up your morning eggs with this quick and easy spinach omelet. Packed with vitamins C and K and packed with iron, spinach has been a favorite muscle-building green for generations. Cooking leafy greens helps your body better absorb their nutrients, so be sure to throw a handful of spinach into every breakfast scramble. Beat eggs, egg whites, and milk together in a small bowl. In a small nonstick pan, add a drop of olive oil, and heat over medium high. Add egg mixture and chives to the pan. As the eggs begin to solidify, pull them back to the center of the pan, and tilt the pan to allow more raw egg to run to the outside. Repeat this until the eggs are almost set. At that time, add the spinach and parmesan. Gently slide the eggs to the far edge of the pan, and using a spatula, gently fold the omelet back over itself. Cook briefly on each side before plating.